A test frame for a Volkswagen Tiguan is inspected at the company's Puebla, Mexico, plant in Oct. 2016. The Trump administration blames NAFTA for hurting U.S. manufacturing jobs. MEXICO CITY -- A U.S. proposal that automobiles should be built in high-wage areas within the NAFTA region is partly aimed at increasing engine production in the United States, and more details on the plan are expected this week, Mexican officials said. 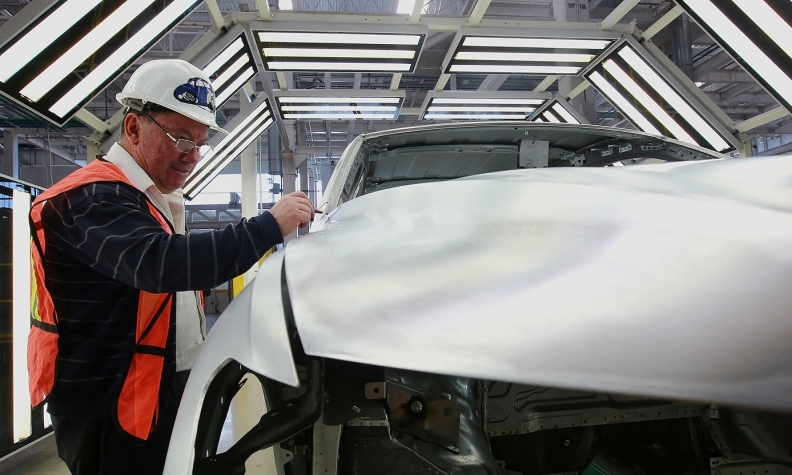 In an idea aimed at breaking a deadlock in talks, Washington last month suggested some automotive production should happen in areas of North America paying higher salaries. U.S. negotiators discussing changes to the North American Free Trade Agreement floated the idea that 40 per cent of automotive production must happen in areas paying wages of between US$16 to US$19 per hour, Fausto Cuevas, the director general of auto industry group AMIA, said on Tuesday. The negotiators have also indicated a preference that motors be built in the United States, Mexican Deputy Economy Minister Juan Carlos Baker said. "The United States proposed baskets of products that they are more interested in. They prefer engines, the most profitable part of cars, to be made in the United States," he said late on Monday. Mexico wants to see a firmer U.S. proposal before responding. "The United States has been changing its proposals, it's better to wait ... and then later present a counterproposal," said Economy Secretary Ildefonso Guajardo. He said more details could come from the United States as soon as this week. Setting wage requirements for the auto industry could benefit the United States and Canada, whose trade unions say that lower Mexican pay has caused a drift in manufacturing capacity south of the Rio Grande. Negotiations to rework NAFTA, which underpins US$1.2 trillion in annual trade between Canada, the United States and Mexico, began last year after President Donald Trump took office promising to abandon the 1994 agreement if it could not be reworked to better serve American interests. Talks continue this week in Washington. The latest U.S. proposal covers "the whole value chain" for autos, said Juan Pablo Castanon, president of the Consejo Coordinador Empresarial, the umbrella group representing Mexican private sector interests at the NAFTA talks. "What is missing is to clarify a series of points to evaluate the proposal as a whole, which we assume will be happening in the course of this week," Cuevas said. Trump's negotiating team wants the overall regional content requirement, so that cars can qualify to be sold in North America tariff-free, to be increased to 85 per cent from a current 62.5 per cent. Additionally, it is looking to establish five categories for auto parts and components with differing requirements, AMIA's Cuevas said. In the first category, seven core components, including the transmission, motor and axles, would need to comply with the 85 per cent rule, said Cuevas. The other categories would have requirements of 75 per cent, 70 per cent and 60 per cent. These new categories and a U.S. bid to eliminate the tracing list, the mechanism by which the regional content level of cars, trucks and large engines is monitored and verified under the trade agreement, makes the new proposal "stricter and harder to comply with," said Cuevas. If negotiators iron out differences and reach an agreement, Cuevas said a "transition period" of five to 15 years will be needed to comply with the new regional content rules. Negotiators are eyeing a new deal by May to give Congress members time to discuss a reworked NAFTA, given that the makeup of both chambers will change after U.S. midterm elections in November. Senate Agriculture Committee Chairman Pat Roberts spoke to U.S. Trade Representative Robert Lighthizer on Monday. Roberts said Lighthizer told him NAFTA "is 80 per cent there." Asked how long it might take to finish, Roberts said, "I'd say weeks. He was that optimistic."